Over the past couple of years, my husband and I have grown pretty fond of Thai food. 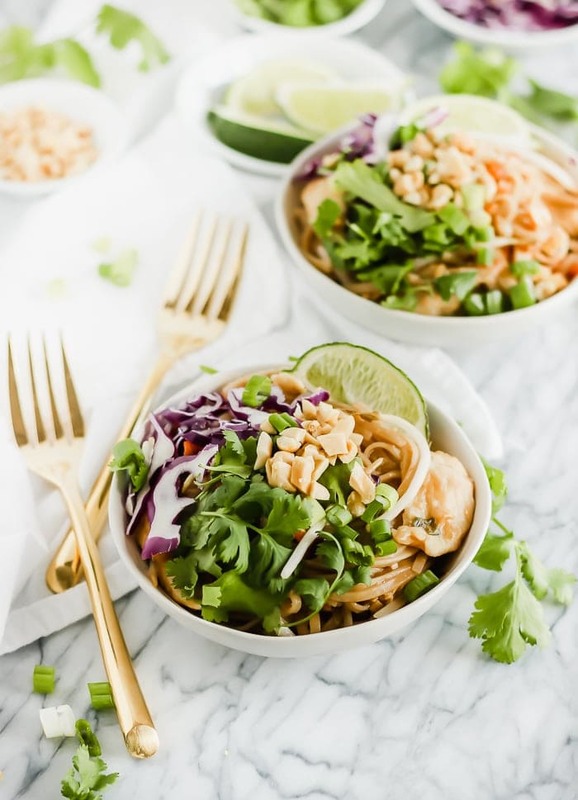 There are so many bold flavors and fresh ingredients involved in Thai cooking, and my husband can’t resist a good noodle dish, which are pretty abundant in Thai food. One of the first Thai dishes we ever tried (which I’m sure is the case with many of you) was Chicken Pad Thai. 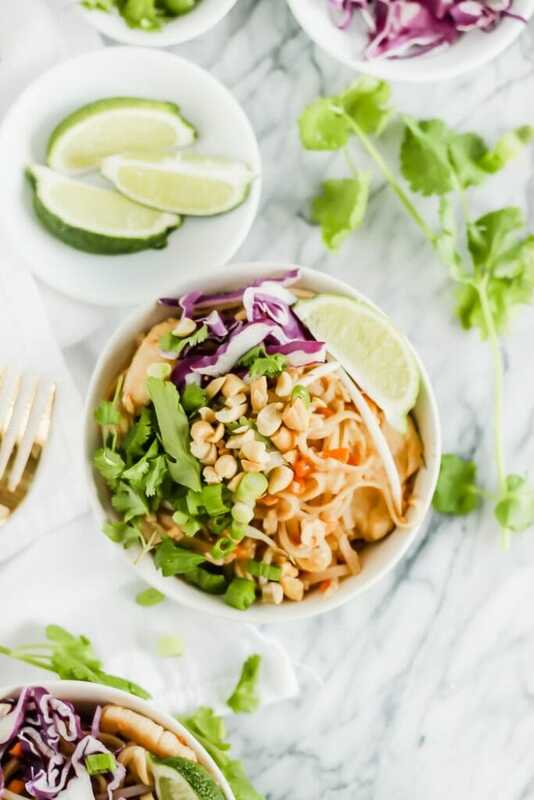 Pad Thai is a classic Thai dish that any good Thai restaurant in America will serve, and in my opinion, it’s the best way to judge a new Thai restaurant! There was a little Thai place in Lubbock right around the corner from my husband’s house in college that we used to go to when we could. They had odd hours and hardly any seating. You were lucky if you could get a table when they were open, because they were always packed! It was the first restaurant that I ate Pad Thai at, and I immediately fell in love.
. Just order some and be done with it. You’ll be happy you did later.
. Oh, Amazon. Isn’t technology amazing? Of course then there are bean sprouts, which you can’t get on Amazon. Bean sprouts are a pain to find sometimes, and they go bad approximately 1 day after you buy them. So if you don’t want spoiled bean sprouts in your fridge make a giant batch of Pad Thai and eat it for days. 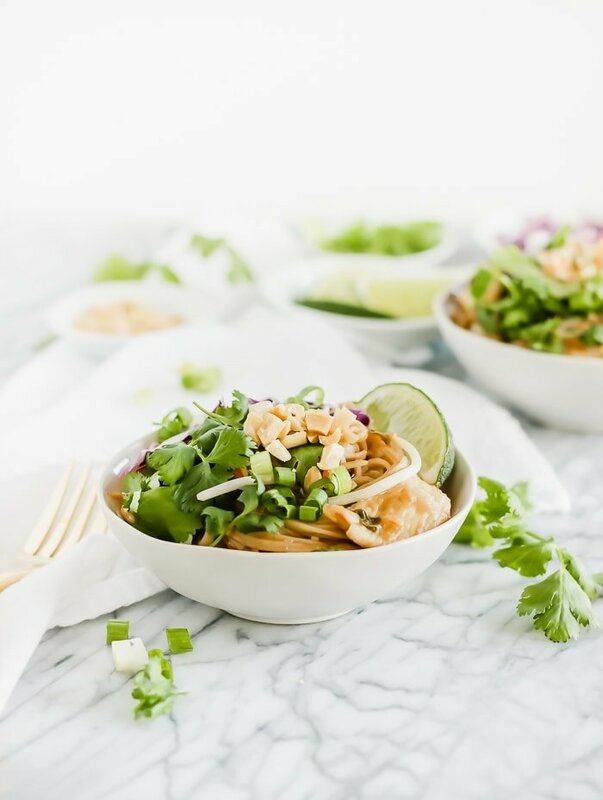 But once you track down all of the ingredients for Chicken Pad Thai, the dish itself is actually quite easy to make. Just prep everything, then cook (which takes all of 5 minutes) and serve! You’ve got a super delicious meal in a snap. And it’s totally customizable, too. Traditional Pad Thai is made with tofu and shrimp, but we aren’t huge tofu fans in our house, so I made this one with chicken. But feel free to use what you’d like. Since I’m a wimp when it comes to spice, I put just a tiny bit in the sauce, and then I put the bottle of sriracha on the table so my hubby can put plenty on his. I also like to have plenty of options for garnish so everyone can make their Chicken Pad Thai exactly how they like it. Everybody wins! 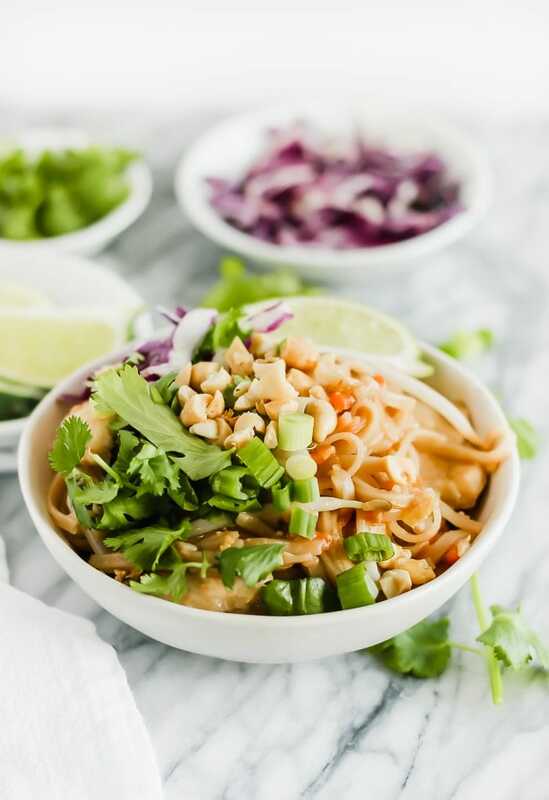 If you’re looking for a delicious way to try Thai food at home, this Chicken Pad Thai recipe is a must. And you only have to buy the hard-to-find ingredients once. After that, you can keep on making this super dish time and time again without ever having to order takeout! 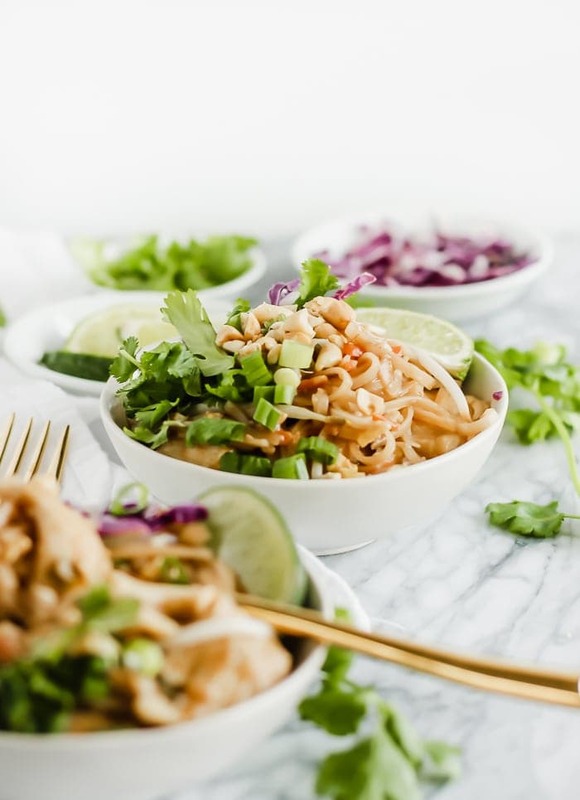 Chicken Pad Thai is a classic Thai dish that you can make in minutes- no takeout needed! Prep ingredients: Whisk together all sauce ingredients, chop veggies and garnishes and slice chicken. In a medium bowl, mix cornstarch and chicken. In a medium saucepan, bring about 6 cups water to a boil. At the same time, heat sesame oil in a large nonstick skillet or wok. Add chicken mixture to heated oil in the skillet and cook on medium heat until chicken is cooked through, about 5 minutes. Remove chicken from pan and set aside. Meanwhile, add rice noodles to boiling water and turn off heat. Let noodles cook for about 3-5 minutes, or until al dente. Drain and set aside. Add carrots and cabbage to wok and cook about 3 minutes. Push to side and add eggs to other side of the pan. Stir eggs until cooked. Add chicken, noodles, and sauce to wok with veggies and eggs. Stir to combine and let sauce thicken. Add bean sprout and stir to combine. 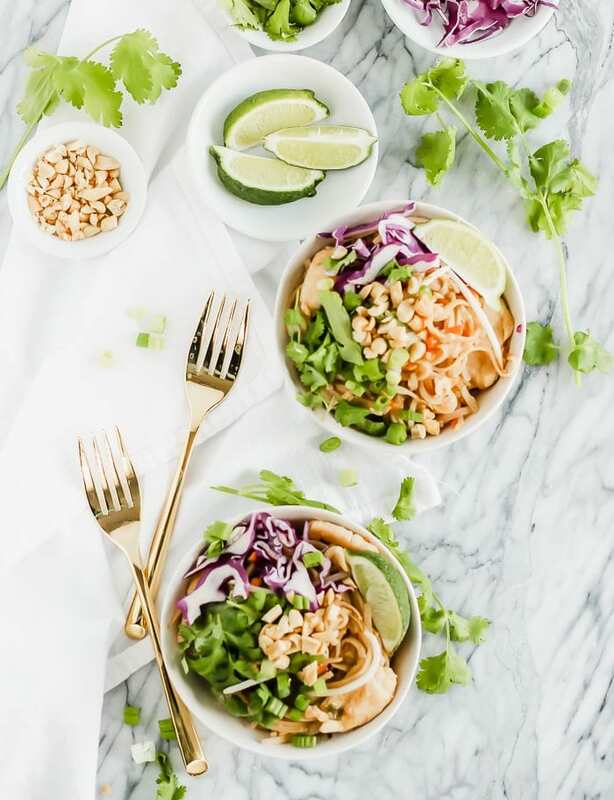 Divide Pad Thai into individual bowls and garnish how you wish! Thai is definitely in the running for my favorite cuisine and it’s exactly because of dishes like this! 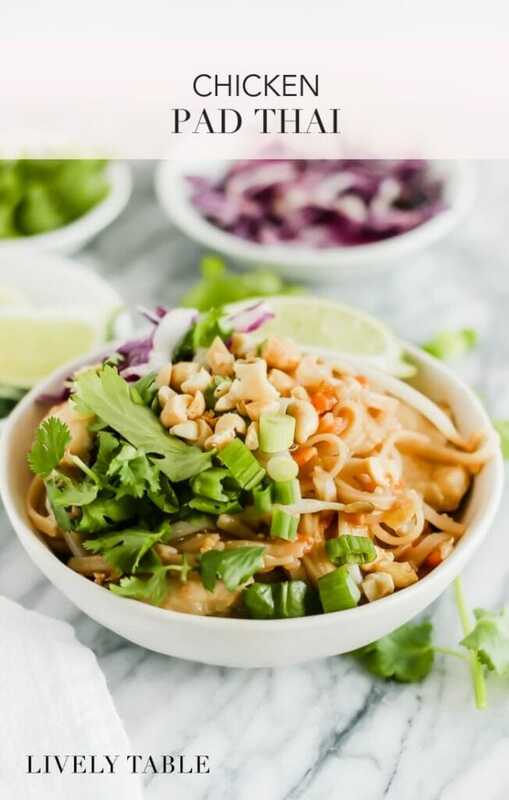 Your Pad Thai looks phenomenal- you’ve got so many wonderful ingredients going on in here!! I love it! Thanks Sonali! Thai is one of my favorites, too! I loooove Pad Thai. I used to work at Pei Wei during college (for over 2 yrs haha) and we got free food– I ordered their pad thai at least once a week lol. I think that’s what sparked my love for thai food! Me too! Oh, I’m so jealous, Pei Wei is delicious! Pad Thai is such a favorite! But hey, any thai is good! I agree! I love Thai!